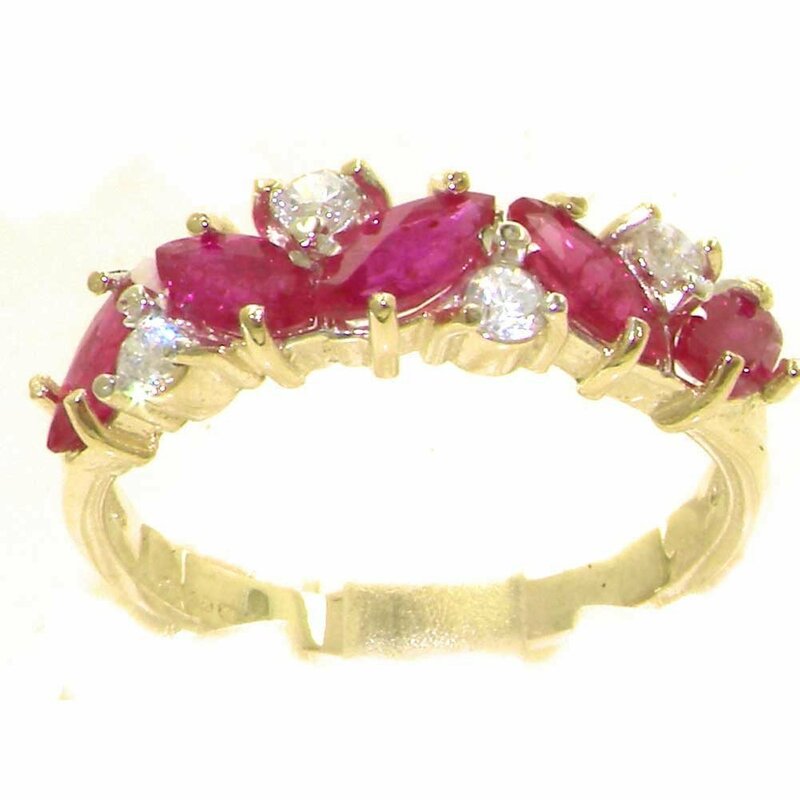 It is a stunning ring — A Beautiful English Hallmarked Solid 9ct Gold Ruby & Diamond Eternity Ring. This stunning ring has been set with with five Marquise cut 6x3mm (0.24″ x 0.12″) Vibrant Red Rubies and four 2.5mm (0.1″) sparkling nice white bright Diamonds weighing a total of 0.24ct. — you want to see this for yourself as the pictures do not give this ring the justice it deserves. Each stone is individually selected and securely claw set in this ring by Expert English Jewellers. Each and every stone is Natural and due to this fact unique so they must be carefully selected to make sure they match in colour & clarity. The colour of the Rubies and the sparkling Diamonds set against the richly colored Yellow Gold is a very eye catching combination. On the inside of the shank there’s a Full British Hallmark which includes 375, the Leopards head and the Royal Crown. A marking which is unique to British Jewellery. This ring used to be Designed and Made in England, and will be sent to you in a Luxury Presentation ring box.